This discussion highlights frequently asked questions, but does not address all of the NFPA 58 requirements specific to steel saddles. We always recommend that you do your own thorough code review prior to making a purchase. Steel saddles are referenced in NFPA 58 as “nonfireproofed steel supports” or just “attached supports”. In most cases, the steel used to make a saddle is not fireproof steel. Fireproof steel would add significantly to the cost and just isn’t usually needed. Per NFPA 58 code, for tanks greater than 2000 gallons, the attached support can be nonfireproofed steel and mounted on flat topped concrete foundations providing the height from the bottom of the container to the top of the foundation doesn’t exceed 6”. Most tank manufacturers are well aware of this requirement and build saddles that are 5-½” to 6” high. When saddles are used to support the tank, they are required to “allow for expansion and contraction and prevent an excessive concentration of stresses.” As you review the drawings or look at the saddles on your new storage tank you’ll notice that one saddle has holes in it (the fixed saddle) and the other saddle will have slots (the sliding saddle). The holes and slots are where bolts will be used to secure the tank to the foundation or pier. In the hole side, the bolts should be firmly attached, but in the slot side the bolts should be snug and have a little room to give. A 50,000 pound storage vessel isn’t going to move much, but this feature allows minor movements caused by expansion and contraction while minimizing stress or damage to the attachments and foundation. If you want specific dimensions, you will need to ask for engineering drawings of the saddles. You may also be able to get anchor setting plans which provide details specific to the saddle types, saddle spacing, saddle center line measurements and other information you’ll need for mounting on piers or other foundations. Saddle calculations can also be provided by the manufacturer. The calculations list specific information including saddle material, design pressure, dimensions, weight, stress testing results, and seismic analysis. For states like California, with higher than average seismic activity, approval of saddle calculations may be a prerequisite to permitting and approval. A pair of saddles on a 30,000 gallon storage vessel can add anywhere from $2000 to $6000 or more. 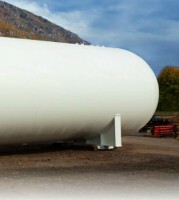 When asking for quotes on new storage tanks it’s important to find out from the supplier if they have included the price of saddles in the total bid. It’s not unusual for suppliers to provide an initial bid for a bare or slick tank that doesn’t include the price of the saddles. This bidding practice allows that supplier to come in at a lower initial price than the competition, but may not reflect the total price you’ll pay. If you need saddles, make sure those costs are included in the total price before comparing all quotes.